1. Cut your pegboard to size. Mine is about 89 inches across. We had a little mishap coming home from the store so we ended up having to join together two large pieces to make the pegboard the way I wanted. Had we not had our little problem, it would have been one large piece. 2. Paint your pegboard. I wanted it to be a nice clean white, so I cleaned it with soap and water, let it dry, then did a quick light coat of bright white paint. 3. Cut your trim to size. My husband is a whiz at mitering the corners and getting everything to fit just right. If you're not as handy you can certainly just do 90 degree angles and have your two short sides cut to fit in between your two long sides. 4. Paint your trim to match or contrast your pegboard. 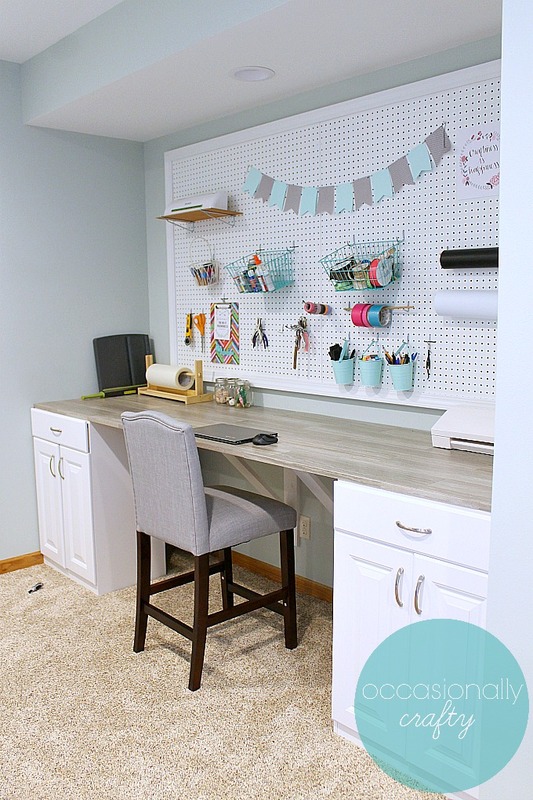 Again, I'm all about the white for the pegboard, so my trim matches. 5. Attach the trim to your pegboard using wood glue or liquid nails. Use painter's tape to hold the trim to the board and let dry fully- following directions on the container. Then remove tape. 6. To hang your board, you can either anchor and screw it right into the wall using some of the pegboard holes for the screws. Or you can do what we did. We hung three long pieces of 1x4 pine boards on the wall itself. Then using a level, we carefully hung the pegboard by screwing it into the pine boards. This gave us plenty of room to use the peg accessories without scraping up the wall. Time to accessorize! I was on the lookout for things that would match the gray/soft teal colors in the room itself. I found the buckets and baskets from The Dollar Spot at Target. The shelf was leftover scrap wood. I made the banner from paper I bought at Hobby Lobby. All the hooks came from Lowe's (similar here). I wouldn't say it's exactly how I want it yet. In the next post, we'll talk about organization and what I'm doing so far. 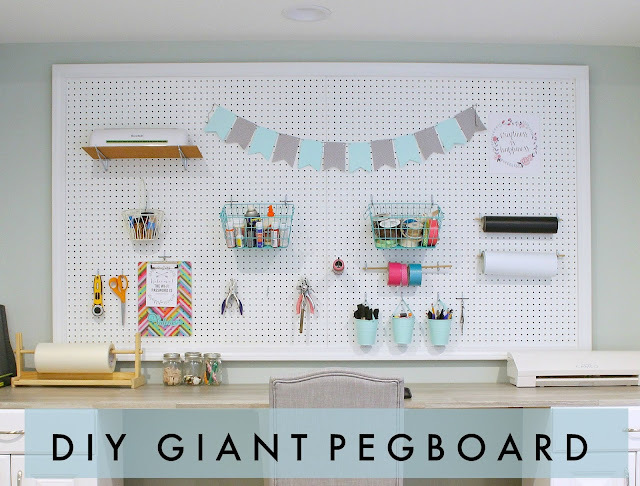 What would you use a giant pegboard for?